Be the first to share your favorite memory, photo or story of Charles "Charlie". This memorial page is dedicated for family, friends and future generations to celebrate the life of their loved one. 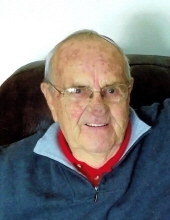 Charles “Charlie” Stessman, 86 of Urbandale passed away peacefully on Saturday, February 2, 2019 at Mercy Hospice in Johnston surrounded by his loving family. A visitation will be from 5:00-7:00 PM on Wednesday, February 6, 2019 at Caldwell Parrish Funeral Home & Crematory in Urbandale with a Rosary at 7:00 PM. A Mass of Christian Burial will be at 10:30 AM on Thursday, February 7, 2019 at St. Pius X Catholic Church in Urbandale. A private family burial will take place on Friday. Charlie was born on a family farm in Earling, Iowa on May 11, 1932 to Carl and Josephine Stessman. He served in the Korean War and later married the love of his life Darlene on June 15, 1957. Together they were blessed with three daughters; Julie, Laura, and Brenda. Charlie sold cars for over 40 years, he spent 35 of those years working at Cresent Chevrolet in Des Moines. He was an avid Cleveland Indians fan and enjoyed gardening and horse racing, but above all he found his greatest joy when he was with his family. Charlie is survived by his beautiful wife; Darlene, children; Julie (Mark) Lovelady, Laura (Kevin) Anderson, Brenda (Jeff) Alaimo, 9 grandchildren; Brett (Jenny), Jared (Andrea), Eric, Chelsa (Thomas), Shelby, Rachel (Alex), Morgan, Aidan, Matthew and 4 great-grandchildren; Kaya, Koby, Lily, and Olivia. He is preceded in death by his parents, Carl and Josephine; his infant son, Bernard; and siblings, John, Leora, Victor, Mary, and Robert. Also surviving is his brother, Albert; and sisters, Margaret and Dorothy. Charlie’s family wanted to express their appreciation and gratitude to the caring staff at Mercy Hospice-Johnston for the loving care and dignity shown to Charlie and his entire family. Memorials can be made to Mercy Hospice in Johnston or the charity of your choice. To send flowers or a remembrance gift to the family of Charles "Charlie" Stessman, please visit our Tribute Store. "Email Address" would like to share the life celebration of Charles "Charlie" Stessman. Click on the "link" to go to share a favorite memory or leave a condolence message for the family.